SUV shoppers in Orlando have consistently chosen the Volkswagen Touareg as their go-to family car for the past several years. Sporting a comfortable interior, customizable options and fantastic power, the VW Touareg continues to be one of the top SUVs on the road today. This model year, the 2015 Touareg is getting some new exterior and interior amenities, including a new grille plate, VW's Drivers Assistance Package and new exterior colors. 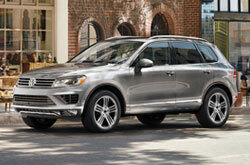 For those who want to customize their new SUV, the 2015 Touareg is the perfect vehicle for you. The SUV comes in three models: V6, TDI and Hybrid, all of which offer individual power and feature options that drivers can tailor to fit their needs. Looking first at the V6 model, Touareg shoppers who choose this model will get a powerful V6 engine and a smooth eight-speed automatic transmission. The Touareg V6 also has a touchscreen sound system, an automatic post-collision braking system, bi-xenon headlights and an all-wheel drive system. Opt for the 2015 Volkswagen Touareg TDI in Orlando and you'll add an eight-inch touchscreen with navigation, push-button start, keyless entry/ignition, lane-change assist and a rearview camera. 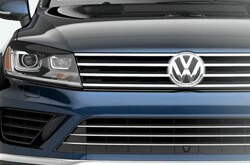 The TDI model is powered by a terrific clean diesel engine that boasts a 765-mile driving range. Green car shoppers who choose the Touareg Hybrid model will also get an impressive driving range and an all-wheel drive system. The Hybrid's supercharged powertrain rates at 380 horsepower and comes standard with adaptive cruise control, autonomous emergency braking and a 12.7-sq.-ft. panoramic sunroof. Other features that our 2015 Volkswagen Touareg review found were new exterior and interior color themes. Drivers can choose between five exterior paint colors: Chrome & Style, Moonlight Blue Pearl Effect, Sand Gold Metallic, Black Oak Brown Metallic and Reef Blue Metallic. Inside, color themes include St. Tropez and Bonanza Brown in leather and Sapelli Mahagoni and Engineered Ebony in wood. For even more information, keep reading our 2015 Volkswagen Touareg review. Stop by our showroom today and test drive the 2015 Volkswagen Touareg in Orlando! Please call 866-318-7865 for further assistance. Compare the 2015 Volkswagen Touareg alongside vehicles like the 2015 Mercedes-Benz GLK-Class, Acura MDX and the BMW X5, and we're sure you'll determine that the Touareg wins over the competition in a multitude areas. 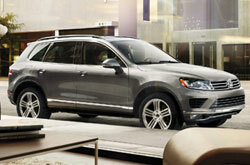 Shoppers will be won over by the Touareg's handsome design, as well as its state-of-the-art cabin features. For Orlando Volkswagen customers who want a truly amazing value, just compare this vehicle's price to the vehicles listed above and you'll see that it's a worthy investment. Take a peek at our Touareg Facts list; look just below for bullets. 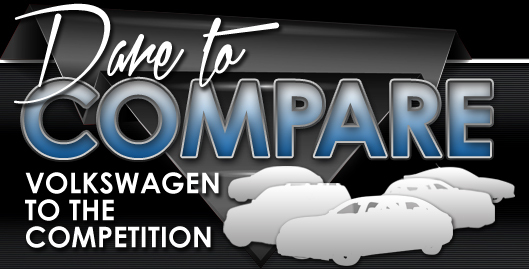 Can the competition beat the Volkswagen? The Volkswagen Touareg review above, along with overviews of previous year models and other 2015 Volkswagens, will help make finding your next car less of a hassle. Our reviews are written by experienced automotive writers - it's just another resource we provide as a chief Orlando area Volkswagen dealer. Crammed with reliable information and specs, each article gives you complete details about all the Touareg has to offer Orlando drivers in terms of safety technologies and much more. Now that you've learned all about the 2015 Touareg, we'd love to have a conversation about how we can help you; use the contact form to message us today to learn about limited-time dealership offers and arrange a test drive!